Editor’s Note: Our reviewers include Jeff Valliere who is daily and fast on the steeps of the Flatirons above Boulder, Colorado, Dom Layfield an accomplished and speedy ultra runner based in Southern California, and Dave Ames, also in SoCal, is a running coach who stays in sub 3 shape and who is training for his first Ultras. Their full run bios can be found here. Note that none of our reviewers ran in the ATR 4 but Jeff ran in 1-3. $130. Available Nov 2018 at REI. and Hoka January 2019 general release. Available in Wide. Dave: I haven’t been the biggest fan of Hoka’s road shoes over the years (just way too soft and beat my legs up), but man, whatever is coming out of the trail department is really, really nice. It’s almost like the trail team is on another planet. Or at least another level! They came strong earlier this year with the Torrent, which I absolutely love for trail racing, and then backed that up with the EVO Mafate, which is a solid go to trainer / racer for those long days in the dirt! Dave: Why do I like Hoka trail shoes? They don’t feel like a Hoka. So...say hello to the Challenger ATR 5 (All Terrain). Note: I did not run in previous versions, but when you take a look at the ATR 5, there is really nothing special about it in terms of looks. It supposedly was softened up a tad from versions 3 and 4 and gained just a tad over 0.5 oz from the 4. However, It’s plain and simple, rides well on road and trails, and honestly, without a Hoka label slapped on it, one would think it may be a knockoff. But step in is real nice and my size 9 is spot on for my narrower foot, with some width in the toe box and plenty of room for cruising downhills without toe jamming. It laces up quite nicely and through the use of the last eyelet, I am locked and loaded with no slippage. For those with wider feet it is available in wide. Dom: Like Dave, I haven’t run in previous iterations of the Challenger ATR. Long ago, I briefly wore a pair of an early version (1st or 2nd gen) at a Hoka shoe demo. Then I tried on v. 3 in a running store. Both times, I came away disappointed. Plenty of people were excited and positive about the shoes, but to me they seemed narrow and just not foot-shaped. Certainly not shaped anything like my feet, anyway! From what I can gather, the ATR got wider with version 4. Or maybe my feet just got used to the Hoka last, as I started running regularly in the Clayton 2 and then the Mach, Speedgoat 2 and EVO Mafate. Dom: Whatever happened, putting on the ATR 5 was a very happy surprise. Although far from an Altra/Topo wide forefoot, the shoe now feels much more comfortable and less restricting. I’ve always preferred my shoes soft and neutral-feeling. In this regard, the ATR is a delight. The sole is full-on Hoka maximalism, with bottomless marshmallow cushioning. The upper is uncomplicated and functional. Jeff: I have a long history with the Challenger ATR having run in versions 1-3. I have always appreciated the lighter weight of the shoe, given how well cushioned, responsive and reasonably secure the upper has been. My number one complaint however was with outsole durability issues, where the rubber sections of outsole would peel off from the shoe. This would begin for me after about 15 miles and continue to steadily degrade. 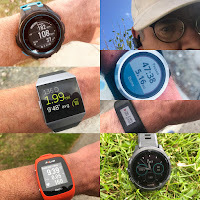 This only seemed to be a serious concern for those who run steep and rocky trails, given the rough surfaces and shear forces associated with running fast on such terrain. I know others who use the Challenger ATR and experienced the same issues on mountainous terrain, but I think was less of a problem for those who run on more moderate trails. Given the issues I have had with outsole durability in prior versions, I was most excited to test the new revised outsole, the first improvement of it thus far in the Challenger lineage. Dom: In term of appearance, I feel like Hoka knocked it out of the park. The black/fluo green colorway doesn’t take a lot of risks, but I think it looks great. The look is distinctive but understated and stylish enough that I would be happy to wear the Challengers as a casual shoe. Dom: Functionally, the Challenger ATR 5 has a spartan, efficient, and uncomplicated upper. Overlays are limited to a minimum, and seem entirely structural. The dominant fabric is a open mesh layered over a much denser, smooth liner. The fabric is strikingly inelastic, and such materials are typically unforgiving -- too tight in some places; too loose in others; prone to developing undesirable creases. Additionally, without some stretch to the upper, getting the right lace tension can be finicky. But there’s a little give in the laces themselves, and for me at least, the shape and materials just worked. Dom: There are flashes of fluo green color showing through the outer mesh in the vicinity of the lace eyelets. Close-up from inside shoe, showing that bright yellow markings are non-structural and printed on inner layer of upper. I assumed that I was seeing structural elements connecting the lacing to the sole. But no -- there is no such reinforcement, and the striping is purely cosmetic. All of the lace tension is transmitted through the two layers of fabric and the heel collar. I found this surprising, and was expecting midfoot hold to be compromised. Although I wouldn’t cite foot retention as a standout strength of the ATR 5, it is fine for most uses. Dom: The lace eyelets themselves are notable for having a cord loop on the outside that looks very similar to Nike’s Flywire construction. Perhaps because I’d previously seen Flywire, I expected the cords to connect right through to the sole. Surprisingly, they do not, instead terminating immediately in the lace collar. Dom: I also noticed that finely woven inner fabric did an excellent job at keeping out trail dust. Dave: Very simple upper here. The perforated mesh lays nicely across the top of the shoe, creating some decent breathability for me here in SoCal and molds the foot well, while also allowing a good amount of width and splay for those longer runs on the trails. I have not had chance to get the shoe wet or muddy, well because it really doesn’t rain here in SoCal. Jeff: For me, the most significant change to upper of the Challenger ATR 5 is fit. Traditionally the fit of the Challenger ATR has been quite low volume, if not on the narrow side of snug, particularly in the forefoot, which has worked well for me, but many others have complained of the narrowness. It seems as though Hoka has listened and added a noticeable amount of volume, somewhat to the midfoot and mainly to the forefoot. While wearing thin socks, I have to crank the laces such that the Flywire style eyelets are nearly touching one another and even then, I don’t feel as though the upper is holding my foot secure enough to make for a stable ride in technical terrain. With mid thickness socks however, I am able to compensate and achieve somewhat of a better fit, though does not completely alleviate my instability at times. Fit overall is true to size and if you have a larger volume foot, or are just looking for a bit more room for toe splay and swelling over longer runs (where the Challenger ATR 5 excels), then this is a welcome change. If you run more technical terrain, then look to the Torrent, Speedgoat or perhaps even the EVO Mafate. The materials here are sturdy and durable, reasonably well ventilated, though do not have much give at all. Dom: The midsole of the Challenger ATR 5 is classic Hoka with that characteristic plush, pillowy feel. For me, it was strongly reminiscent of the EVO Mafate. (And less like the Torrent, which is lower and stiffer, or the Speedgoat 2/3 which is higher and stiffer.) The Challenger and EVO shoes felt so similar that I went for a run with a Challenger on one foot and an EVO on the other, and found that indeed there was little to separate them in underfoot feel. Dom: In terms of construction, there is no rockplate, and midsole has two colors of EVA foam with different durometers (firmness of foam). The upper layer (dark gray in this colorway), around the periphery of the shoe feels softer than the lower layer (fluorescent green). Dave: Rockered in a good way and with a 5mm drop, you will find the sweet spot every time. For the amount of cush the shoe packs, it’s very light weight and boasts a smooth, efficient heel to toe transition on the trails. Jeff: The midsole feels the same to me as previous versions, deep cushion, plush and comfortable with a level of firmness so as to not feel mushy or unstable. Response is excellent and as Dom noted, is somewhat reminiscent of the EVO Mafate, though I still find the EVO Mafate to have more pop. Editor's Note: At the introduction of the Challenger ATR 5 (see our preview article here) Hoka told us, compared to the ATR 4, that the midsole of the ATR 5 would return to the slightly softer feel of the ATR 3. Dave: The rear outsole lugs were tweaked to be closer together at the rear for a smoother more consistent ride, while the lugs up front are spaced out a tad for more grip on uphills and downhills. Dom: With relatively wide, shallow (4 mm) lugs, I wouldn’t expect the outsole of the Challenger ATR 5 to perform very well in really tough conditions (like wet grass). But for everyday use, particularly on the dry, dusty trails here in LA, they have plenty of grip while retaining a nice smooth underside that makes running on pavement comfortable. Dom: Not a lot of wet conditions to be found in Southern California right now. But I hosed down some asphalt to compare wet grip of Challenger ATR 5 and EVO Mafate. The EVO Mafate had the edge, but not by much, and my guess is that this was due to the softer outsole material conforming more to the irregularities in the aggregate. Grip might be different on smoother rock. Jeff: With about 30 miles on the ATR 5, primarily on rocky, rough technical terrain, I have not yet seen any signs of delamination on the outsole, as has been the case on previous versions with about half that mileage. So far I am optimistic that these will hold up much better over time. The rubber compound also seems to be of a harder durometer, likely increasing durability and longevity, however I have found that tracton on rock and particularly in wet conditions suffers somewhat. Dom: Again, classic Hoka: cushioned and smooth. For roadies looking to go fast, or other types that like a firm ride, the Challenger ATR 5 may feel a little squishy. Personally, this is exactly the underfoot feel I like for everyday trail running, particularly during high-volume phases when I need to baby my feet. Dom: There is enough cushion that a rock plate is superfluous: rock strikes are barely noticeable. But because the sole is flexible, it conforms around prominences without feeling “tippy” (that sensation of unstable teetering on top of a rock) and allowing good ground feel. Dom: One of my all-time favorite trail shoes was the Montrail FluidFlex. What was refreshing about this shoe was its near-perfect simplicity. There was an upper with minimal decoration and overlays, a thick slice of midsole, and modest patches of outsole to provide grip and durability. The result was light and soft and wonderful. I went through four different pairs before Montrail sadly discontinued the shoe. The replacements “fixed” the flaws of the FluidFlex, resulting in a series of increasingly characterless and forgettable shoes. This is a cautionary tale of product design. But I digress. The reason I mention the FluidFlex is that this is the shoe that the Challenger ATR 5 reminds me of. Dom: In case it wasn’t obvious already, I’ve been highly impressed with the ATR 5. Although I’m sure there are a thousand and one design choices that I’m blissfully unaware of, the shoe feels simple, functional, neutral and stripped of all superfluousness. The ATR 5 is like a updated FluidFlex with extra cushioning. Dave: Smooth, efficient and properly cushioned. As stated above, the shoe isn’t much to look at, but it gets the job done and it gets it done well. It just works. For those looking for the Hoka cush, it’s there, but for those looking for the firmness and snap that I feel Hoka should do more of in much of their road line, it’s there too! My legs feel very fresh on the trails in the ATR 5 and I feel this should definitely be a training workhorse, especially if you are into the Ultra world, or getting into it like me. Winter road runners? Perfect shoe for slopping through slush and snow. The outsole should grip just find on sticky snow and freshly plowed roads. Jeff: I agree with Dom and Dave that the ATR 5 is cushioned and smooth, ideal for long training runs or races where you want maximum cushion, good response and a quick light feel. As to Dom’s comment about contouring over ground obstacles, I find that the ATR 5 only does this moderately well on smoother to moderately technical terrain at moderate to slower speeds. At faster speeds on steeper, rocky, technical terrain, when really leaping fast across rocks, stability was is a bit on the tippy side and I find myself backing off. The Challenger ATR 5 is an intriguing contrast of maximal cushioning and minimal everything else. This is a shoe that will please most people, but is not for everyone. Its forgiving ride is smooth and comfortable on both road and trail, and traction is good in all the conditions I’ve been able to test. At the same time, the shoe is soft, neutral, and very light for the amount of cushion it provides. If you don’t need a lot of support or guidance from your shoe, and just want that signature Hoka ‘marshmallow’ cushioning on trails, this is an outstanding shoe. Midfoot retention could be improved for confidence in aggressive maneuvers or technical terrain. So far so good. Recommended for the trail runner looking for a simple, well executed shoe that is light and performs well on a variety of different terrain. As stated above, Dom and I live in SoCal and it’s always dry. I am interested to see how the ATR 5 performs in rain, mud and snow. For you winter runners, I can also see this being a great option for those snowy morning road runs of really any distance. Well done Hoka! -.2 for being a hair wide for my narrow foot in the toe box. However, for Ultras this is probably going to help!! Everything else is pretty dang solid! I find the Challenger ATR 5 to be a great long distance trainer/racer for those looking for maximal cushion in a lightweight and responsive package. The ATR 5 excels when running fast on moderate to less technical trails and can really feel speedy when pushing the pace downhill, though when encountering talus fields, rock gardens, off camber/technical and off trail, I have to back off more than I might when wearing the Speedgoat 2 or 3, the Torrent and even the EVO Mafate. I think much of this instability in technical terrain comes from the more voluminous upper, mostly associated with midfoot retention, although that same added volume is simultaneously what makes this shoe better for its intended purpose, all day running. -.2 for somewhat insecure fit, particularly in the midfoot, causing stability concerns in technical terrain. -.2 for traction, particularly on slabby rock and particularly in the wet. Dave: Another 2 top performers here. 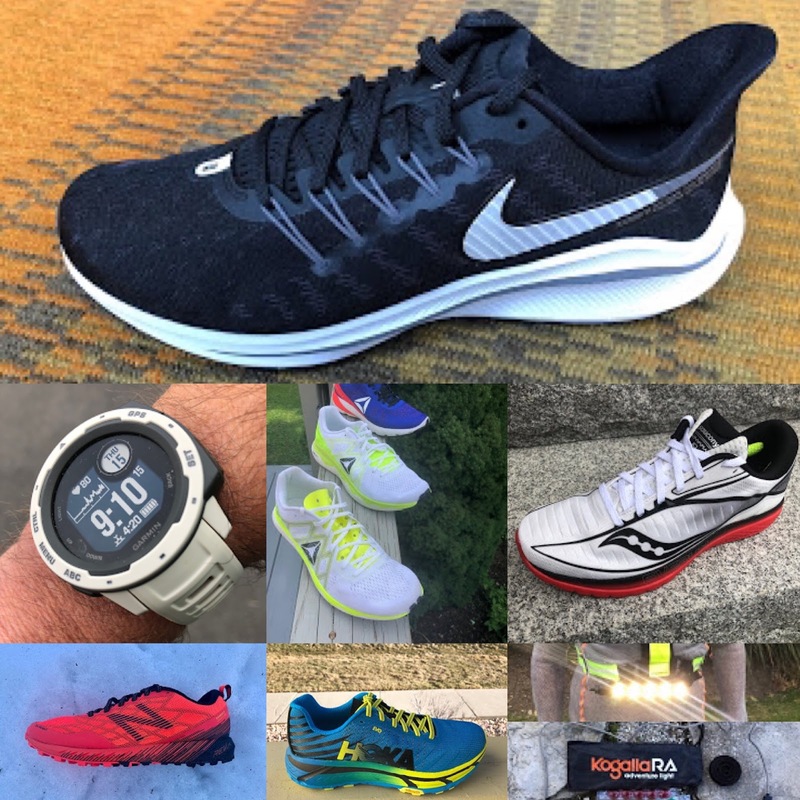 As I opened this review with….Hoka is coming hot with some nice stuff right now. EVO Mafate is seriously in the running for me to race them at Rocky Raccoon 50 Mile in Texas come Feb 2019 as of right now. It just does everything really well and the outsole grips like a mofo! ATR 5 definitely gets the job done, but to sum it up….save the ATR 5 for training and use the EVO Mafate for those longer races at 50 miles plus, or for muddy, more aggressive terrain. ATR may not do so well on the East Coast’s more technical wet trails. Dom: This is a key comparison as the shoes are very similar. Foot retention is slightly better in EVO; the ATR 5 has a roomier fit, with similar shape to Torrent; ATR 5 has a toe bumper. Things I regarded as weaknesses of the EVO Mafate were the minimal, too short tongue (far better in the ATR5), and lack of outsole durability (probably better with ATR5 -- time will tell). In addition, the ATR 5 is cheaper ($130 vs $170 MSRP) and lighter (by ½ oz, 14 g per shoe). The standout strength of the EVO Mafate was the wonderfully plush ride, and the ATR 5 is almost indistinguishable in this respect. From my point of view, a clear win for the ATR 5. Jeff: Aside from the too short and migrating tongue and overly pronounced lugs (though they break in nicely over time), the EVO Mafate works better for me, as it is faster, lighter, more adept in technical terrain, has better traction and better fit. The ATR 5 however is a great option for more mellow terrain where you may not need super secure upper retention or more aggressive tread, not to mention the ATR 5 is $40 less. Jeff: The Challenger ATR 5 has a more roomy fit, yet consequently is less secure on steep and/or technical terrain. The Speedgoat 3 is more stable and secure and thus find it to be a faster shoe on technical trails, though the Challenger 5 is lighter and more responsive, but mainly excels on less technical terrain. Dave: These are 2 beautifully executed trail shoes from Hoka. I feel they both have different uses for me. The Torrent is a true trail racer. I use it for shorter trail races, trail workouts such as Fartlek, Tempos or hill sessions and just plain if I want to fly. The ATR 5 is more of the general daily cruiser for me, or for longer distances in the dirt. I would use the Torrent this weekend - - but I am not completely sold it’s enough shoe for me underfoot for my 32.2 miles and 5000 ft of vert race. (race was cancelled due to California wildfires) Torrent has tended to bottom out on me after 20 miles. I also does not have the width I want in the toe box for 4+ hour runs. Dom: While the character of the Challenger ATR 5 is classic Hoka -- soft and highly cushioned, the Torrent is something of a departure, being lower to the ground and more responsive. Both are excellent lightweight, race-able shoes, so choose according to your taste. Torrent notably has deeper tread and likely better traction in slippery conditions. Torrent is also lighter by ½ oz (14 g) per shoe. Jeff: Torrent for shorter faster stuff, particularly in technical terrain, however for longer Ultra length distances, the Challenger ATR 5 is a great pick for added cushion and all day comfort (though stick to the less technical trails). Dave: While Max Trail is a phenomenal trail shoe, and honestly, it transitions better for me from heel to toe in the dirt, it is unstable laterally. I do not feel as protected rounding corners with the Max Trail as I do with the ATR 5. While the ATR comes in at some higher stack, it has more lateral stability, which is something Skechers Performance has struggled with in their trail lines over the years in my opinion. It’s also too wide on me and has not the best lacing scheme with the detached eyelets. Slight edge goes to the ATR 5 here. Dom: Ironically, I purchased a pair of the Skechers MaxTrail 5 Ultra based on the review here on RTR, and found them deeply flawed. While I loved the comfort, cushion and ride on both road and gentle trails, on technical terrain (or even just off-camber trails) they were downright terrifying. Foot retention is decent longitudinally (presumably due to the innovative heel loop) but is almost non-existent torsionally. Again and again and again, my foot rolled off the top of the shoe. The same compliant, stretchy upper that makes them so comfy also makes them life-threateningly unstable. Because of this catastrophic flaw in the MaxTrail 5 Ultra, there’s just no comparison. The ATR 5 is a better shoe. Jeff: I was about to type almost verbatim what Dave and Dom said above. I am conflicted on the MaxTrail 5 Ultra, as I really did enjoy the overall feel of the shoe, but they are dicey in technical terrain and do not hold my foot at all while speeding around corners. Definite all around nod to the ATR 5. The Challenger ATR 5 is available exclusively now from Hoka One One here and REI here. General release January 2019. Do you mind providing your comparison of the ATR 5 to the Napali ATR which you previously reviewed? I've run in the ATR 2 and 3 and now have a pair of the Napali ATR's and have been happy with all three, the ATR 2 was a little narrow for me. I tried on the ATR 4's and though they were too high volume in the toe box compared to the 3's and the Napali ATR. Hey Derrill, nice to hear from you, it has been a long time. The Challener ATR 5 is noticeably more voluminous than the shoes you mention, which I think is a simultaneous improvement/detriment depending on your use. If you want a shoe for longer runs on cruiser trails, the ATR 5 is awesome, but for hitting more steep and technical terrain, as I suspect you may, the Speedgoat 2/3 or Torrent would be worth a look. I'm so pumped for these! I loved my Napali ATRs but they were totally blown out after barely 150 miles, with a massive rip in the medial toebox from my 1st MTP pressing on it and the outsole peeling everywhere. Sounds like the Challenger 5 really addresses those problems! Hey guys - thanks for the reviews. The one thing bogging me down with Hoka trail shoes is their stiffness when it comes to climbing. Went through a lot of Speedgoats, tried the EVO - and they feel like boots compared to the....... New Balance Beacon - yes, on trails!!!. How is the fore foot flexibility in the ATR 5. Does the fore foot flex or is it stiff? These ATR 5s look rad. Hey Gus, I find the ATR 5 to be responsive and not prohibitively stiff when climbing, but I also have not had issues with the Speedgoat 2/3 and especially not the EVO Mafate. Great review as always! Which Salomon shoe would be comparable? How is ATR 5 compared to the Ultra Pro? Ante, for all day comfort and cushion, Salomon Ultra Pro and Sense Pro Max would be closest, but the ATR 5 is lighter, more responsive and better cushioned (though not as good traction/tech. performance as the Ultra Pro). Jeff, ATR 5 is more roomy than Caldera 2, though foothold not as good. As always, I suggest trying before committing, if you can (easy online from a site like Running Warehouse). Roomier than the Caldera 2? Now you're speaking my language. There's an REI in my neck of the woods, may have to pay them a visit. Thanks! Picked a pair up at REI. Probably my favorite Hoka shoe so far. I can only compare this with the SG 2 and the EVO. I love to climb and I love wiggly trails: ATR 5 is more open in the toe box - and this width increase kind of travels down the rest of the shoe. The upper is minimal- on steep toe offs sort of felt the mesh on top of my toes, but that was it - kind of went away during the run. I felt fine on off camber stuff and the shoes felt like they had snap on short little climbs and on longer climbs too. I love rockered shoes - this shoe is rockered. I'm using the stock insole and I will switch the flat laces to bubble laces. The SG 2 are a decent shoe - but the sole does not flex - I have to spend way to much energy getting up hills wearing the SG 2s. The Evo - too much shoe and everything is uncomfortable - I feel like I have to drag them up climbs - every step I took something is rubbing - no fun. Initial run in ATR5: 1HR 20MIN. Compared to my NB Beacons, my legs feel fresh and mentally I wanted to keep on running rather than get back and stretch. These shoes feel like I'm cheating. Can't attest to shoe longevity. Hi Gus, Thanks for your comment. Glad you are enjoying them. I'm amazed at the toe box, especially in the 2E I picked up. Couldn't help myself, Hoka makes a well cushioned shoe with a foot shaped toe box, I'm going to buy it. No runs in it yet, but initial fit up front is unlike any Hoka before - and Jeff you are right. Much more room up front than the Caldera 2. Shockingly so. How do they come up size wise. Im normally a size 10 in a trainer (brooks etc) but have gone 10.5 in most Hokas largely due to how narrow they are. If they have now sorted out the width would you still go 10.5 or 10? First of all, thanks for your great work here at roadtrailrun! I'm visiting your site daily to look for another insightful article to read. My question is: which shoes would you recommend for road-to-trail use? I have to go for atleast 2-3km road each way (hilly vineyards, but still pavement) until i reach the local woods where i find some moderate trails (intended for Mountainbikes) and dirt roads. I'm trying to mix my running routine up a little since i've finished my first marathon a few weeks ago. I've been running road only until then. I'm doing ~50k a week and in my rotation are the Gel DS Trainer 23 (track only - great outsole for wet tracks), kinvara 9 (whenever i want speed) and ravenna 9 (everything else - also abusing these on the trails right now). Can you recommend something for me? The ravennas don't feel as save as i want them to, especially when the trails are wet. Maybe a shoe which i can also use on snowy roads? Thanks alot and best regards! Thanks for visiting and following RTR! Much appreciated. The Challenger ATR 5 would be a great choice for door to trail with a lean towards trail. Another to look at the Topo Ultraventure, also leans trail but quite good on the road. If you want to lean a bit more towards road the Salomon Sonic RA, NB 880, and NB Gobi would be good to consider. If you want to go more radical the Skechers Max Trail 5 is worth a look. It's upper is not the best on more technical trails but it has a very dynamic fun ride on road and trail. Hope this helps. Reviews of all mentioned can be found at the link below. How does the fit compare to the Torrent? Same essential shape and feel of the uppers? Hi all, a great review and really helpful. As someone who is prone to rolling the odd ankle i wondered how supportive they were ? Anon, depends on the terrain. I find them stable and supportive on smoother terrain, but on steep, technical terrain, they feel somewhat tall and a touch prone to rolling. The Speedgoat 2/3 is much more stable in my experience. After a few short runs in the ATR 5 I was curious if anyone shares my experience? I have to admit that while the bulk to the trail running community turns it back on Nike, the Wild Horse has taken me the furthest on runs over other models and brands I've tried. Your description of "firm and plush" is dead on and seems to fit me best. BUT I was curious about pillowy HOKA and the wide ATR fit my foot. To be fair I've only gone as far as 3 miles, testing a little on asphalt but mostly on hard/soft snow here in Vermont. They've fit well, have been stable and I haven't had traction problems yet, though I don't see them being a mud season shoe like the Torrent. But I've noticed two things that have me looking forward to the WH5 and wonder if it is just the process of transitioning to the max cushioned shoe OR a "bad" reaction to Hoka cushioning. The first is stress on my calves. Not pain, but not fresh, especially after inclined runs. Nothing like what I experienced with the SG, but enough that it made me hesitate to want to take them on a longer run. The other was shin tightness and soreness and I NEVER deal with that. Any thoughts? Hey Chris, it is hard for me to say, as I have been running in Hoka since 2010 and have gotten pretty used to the maximal cushion, as well as hundreds of other shoes in steady rotation. Because of this, I never truly adapt to any one shoe over time, for better or worse I guess. I have heard others express similar concerns as you, but am not sure if these issues clear up after a few runs getting used to them, or if just very rare isolated incidents (could be both I guess). Gut feeling is that over time, with some care, most would adapt, but hard to say for sure (and don't hold me to that!). While I have not run the ATR 5 if I may venture a guess... The upper in combination with the softish midsole may not be stable enough for you on frozen and soft snow where the lower legs work yet more than on dirt. I ran the original ATR and they were excellent but for me more a smoother trails shoe than technical and uneven terrain shoe, I got similar pains but more on the side of lower ankle in the very soft original Clifton 1. Thank you for the perspectives, I think there's a lot of various truths in what you both have to say. I actually found the roughest feeling to be on road, almost to being unpleasant so maybe Hoka no for me. BUT I will save them for summer and see how dirt works, though Vermont doesn't give us much in the way of smooth! Or for my trip to the buffed trails in Boulder. Buffed trails around Boulder? Hey wait a minute! I guess you can find them (Lions Lair, Mesa Trail, Green/Bear, Long Canyon) but many are pretty rocky/technical. Ok "buffed" might have been pushing it :) But every time I go and run Walker Ranch or Mesa there are stretches when compared to the rocks and roots of NE, I marvel and the dust! But you're right, as soon as I get comfy the rocks grab me! But the age-old debate? I say you all have the rocks and cougars, we have the roots and wet leaves! How would you compare it to the Topo Ultraventure?